I have won very few things in my life. There was a story contest in the first grade and a poetry contest in the third (they must have had very few entries for that one because I’ve seen the submitted poem and it was nine ways to awful). My only award as an adult has been winning second place in the Women on Writing’s flash fiction contest this past summer (which was really exciting – I might have cried a little, then promptly gone out and spent the award money on new running shoes and chocolate). 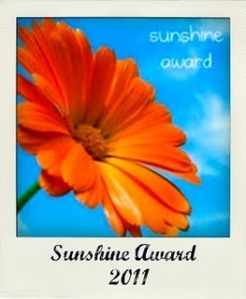 This morning, however, I woke up to a comment from antitheftpotseat saying I was nominated for the Sunshine Award…which I assumed was either an award for friendly bloggers or vampire hunting ones…either way, I’m in! Seriously though, thanks so much for this – I love writing this blog and I look forward to discussing more books and ideas together. – Favorite historical figure: I don’t know. Who’s the guy who invented Pixar? Does he count? If not, I’m going with President Obama. I believe we need more well-spoken, thoughtful people in the history books. – My passion: Just one? Books, then. – The weirdest bit of trivia I know: I’m sorry, but I have no idea. I’ve been trying to think of something for the last three hours, and I’m stuck. I don’t have a trivia-oriented brain (which is especially unfortunate since I love to go to Pub Trivia Night. I am the official dead weight of any team). – My perception of Twilight: Team Charlie! Yes, I’ve read them. Judge away, but just know you’re jealous as hell that you haven’t written a book that teenage girls will cease texting for (unless you have, in which case, rock on). – My favorite sport I wish I played: Roller derby. Obviously. – My favorite place to visit: I don’t have a single favorite. Kyoto is high on the list. And Boulder. I loved living in the Netherlands. This is hard. How could I just have one? – My regret: Not being a kinder person. I can be very blunt, especially with my family, and I wish I remembered to bite my tongue more often. – What’s your go-to book when you need to change your perspective? – If you could have been born in any country other than your own, where would you choose? – What do you do to pass the time on long car trips? – If you were a baseball player and you had to pick a song for them to play when you go up to bat, what would it be? – If you could erase the existence of one kind of technology, what would you choose? – Do cats really have nine lives? – What trait would you like to strive for most – truth, compassion, or justice? – Who would you turn to in those dark hours before the dawn? – What’s one thing on your mental bucket list you plan to do this year? – In ten words or less, what’s the bravest thing you’ve ever done? Maria, you rock!! Thanks so much for the award:) I am in the middle of the A-Z challenge so I’m not sure what day I will post my answers but I will let you know. Thanks again and congrats to you for receiving it yourself! I have loved following your blog since Joe clued me in back at Thanksgiving (and I’ve tried to take a lot of your advice to heart)! Good luck with the challenge and no rush on the award posting; as far as I could tell, there’s no time limitations. I am so flattered to be nominated… It is often a challenge to write in such a way so as to avoid rants and diatribes, and I cannot begin to count the number of words erased and edited in the process of blogging. To be recognized by a peer as someone worth reading is truly an honor. I’ll be working on my answers over the next short while. I very much hope others will discover your blog after this. I would never use the word “rant” to describe your style either – instead, I think of conscientiousness and a community-oriented spirit that I admire. Pleasure to Nominate you Maria. Being a tireless book reader myself, I can understand the effort, dedication and patience it must take to review them after reading. Thank you so much for the nomination, and I look forward to seeing your posts pop up in my google feed!